To start, I will list last year’s Masters Tournament Sunday, where Patrick Reed started the day with a 3 shot lead over Rory McIlroy but throughout Sunday had to hold off a bevy of challengers and charges to claim his first Green Jacket. 2015 Champion Jordan Spieth (2014 runner up, 2016 54-hole leader), started the final round nine shots off of the lead held by Patrick Reed but put on a display that will not soon be forgotten around the hallowed grounds of Augusta. Spieth birdied the opening two holes to get off to a fast start but still sat 7 shots off of the lead, but after closing the front 9 with two additional birdies, Spieth found himself only 4 behind. After birdies at the Par 5 13th and 15th, Spieth came to the 16 tee one-behind and hit an average tee shot to around 25 feet. Jordan would go on to hole this putt and I can remember reading his lips saying to his caddie Michael Greller, “Are you kidding me? !” and he went to the 17th tee where announcer Ian Baker-Finch stated, “Spieth has come to this tee on Sunday, 4 out of the last 5 years with a chance to win” which is a remarkable feat. A poor tee shot on 18 lead to a bogey for Spieth and he finished third. Patrick Reed struggled a little on the front 9 but a birdie at 12 (pictured above) settled Reed in to the round. Rickie Fowler was steady all day and a fantastic birdie on 18 vaulted him into solo second and forced Reed to par 18 in order to win. Reed was able to do so and as Jim Nantz declared, “Captain America captures Augusta” for his first major victory. Although not a tantalizing finish over the final few holes, the 2014 final round had a lot of action early in the day. 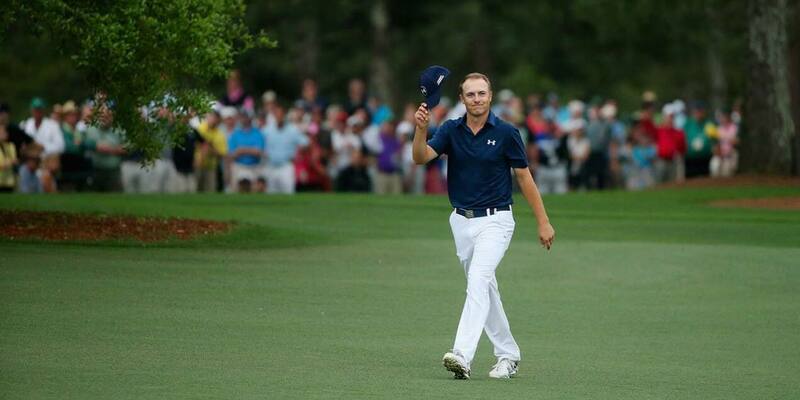 Jordan Spieth, at age 20, was challenging to become the youngest player to ever claim victory at Augusta National. After a birdie at the second hole, Jordan held the outright lead over Bubba Watson at -6 and the lead grew to two after Watson dropped a shot at the third. After a poor tee shot at the Par 3 4th, Spieth inconceivably holed out from the bunker to get all the way to -7, but Watson matched him with a birdie of his own. Spieth would also birdie the Par 3 6th, but it was these holes that Watson believed to be the most important in claiming victory because while Jordan was on fire early in the round, Watson was able to steady himself to stay within striking distance. Spieth’s tee shot at the famous Par 3 12th around Amen Corner found the water (more from where that came from later) and Watson hit a gargantuan tee shot at 13 that lead to birdie and a three-shot lead. Watson would then be able to navigate his way home and win his second green jacket in three years with Masters rookies, Jordan Spieth and Jonas Blixt finishing tied for second. The week started with breaking news when World Number 1, Dustin Johnson, who was playing the best golf of his career, slipped and fell the night before the tournament and sustained a back injury forcing him to withdraw. This maybe could be the break Sergio Garcia needed to claim his first major championship. It was a scintillating back 9 with the action picking up at 14 with Garcia pulling within one of Justin Rose with a birdie to get to -7. Next, at the famous Par 5 15th, Garcia had to hit one of the best iron shots of his lifetime landing around 15 feet from the hole and holing the putt for an eagle 3. Rose would also pick up birdie to leave the two tied at -9 for the tournament. Both hit solid tee shots into 16 and Rose would hole first to get to -10 and then in vintage Garcia fashion, Sergio hit a horrendous putt and fell one behind. Rose would bogey the 17th to leave the two tied again heading to the final hole. Both hit solid approach shots into 18 with Garcia inside of Rose. Rose would miss, leaving the door wide open for Sergio Garcia. Another porous putt from Sergio put the two into a sudden death playoff. A blocked tee shot from Justin Rose forced him to pitch out and try to make par the hard way. He was unable to do so, leaving Sergio with two putts to win his first major. Garcia hit the delicate putt down the slope and only needed one putt with Nantz serenading the U.S. television audience with “Once, and for all for Sergio!” as Garcia overcome with emotion let it all out on the 18th green at Augusta. In this list, you will see that most of the memories will be of a Sunday, but I have longed stated that Masters Saturday is my favorite golf day of the year. “Moving day”, as they say, with the Masters implementing the 10-shot rule, allows virtually everyone that makes the cut to have a chance heading to the weekend. This was the case on Masters Saturday in 2010, when Phil Mickelson made a charge of epic proportions on the back 9 with the roars reverberating all around Augusta National. Mickelson fired a dramatic third round 67 that included an eagle on the Par 5 13th that created one of the loudest roars I have ever heard at a golf tournament. Phil then would follow that eagle at 13 with a hole out eagle 2 at the Par 4 14th to grab back-to-back eagles and headed to the Par 5 15th trying to make back-to-back-to-back eagles for the first time in the history of the Masters. After an errant tee shot, Mickelson was forced to lay-up short of the water but there may be no man in history better with a wedge in his hand than Mickelson, who would spin the third shot within a foot of the hole, barely missing his third consecutive eagle but ultimately leading to a tap in birdie. Fred Couples chipped in at 15 to vault himself into contention and Tiger Woods would close with birdie at 18 to get into contention and Lee Westwood would finish at -12, one shot clear of Mickelson heading to Sunday. Something tells me that there will be more of this tournament later in the rankings, but for now, this Saturday had it all. Again, not an overly dramatic final few holes, but the storyline remains unmatched. After coming up short to Bubba Watson in 2014 as a Masters rookie, Jordan Spieth redeemed himself with a remarkable performance to claim his first major championship and Masters victory. Spieth’s total of 270 tied Tiger Woods in 1997 for the lowest score in the history of the Masters Tournament and became the first player to win the Masters wire-to-wire since Raymond Floyd in 1976. Spieth was the first player to ever reach -19 at the Masters Tournament with a birdie at the 15th hole but a bogey at the final hole brought him back into a tie with Woods. It was a commanding performance that was never really in doubt throughout the week. A few moments pushed Justin Rose and Phil Mickelson close to Spieth but he always responded and held off all competitors to win following his relative disappointment in 2014. Number 7 on this list was 2010’s Saturday and I mentioned that I had a feeling that this final round would also make the list and here we are. As mentioned above, Mickelson trailed Lee Westwood by one stroke headed to the final round. Fred Couples made two early birdies to get within 3 of Mickelson early on the Front 9 but a bogey-double bogey stretch around Amen Corner undid Couples. Tiger Woods started disastrously, sitting at +3 for the round through 6 holes but a hole out eagle 2 at the 7th sparked some life into Woods but an untimely, sloppy three putt at 14 cost Woods and even with an eagle at 15, Tiger came up short and finished tied for 4th with K.J. Choi. The biggest charge of the day was brought to you by young star Anthony Kim (we miss you A.K.) who birdied 13 and 14 before holing a semi long putt at 15 for eagle to get within two of Mickelson. After a decent tee shot into the 16th, Kim holed the birdie putt to go five-under over a four hole stretch to get within one of Mickelson but two pars at the final two holes left Kim in third alone with a blistering final round 65. 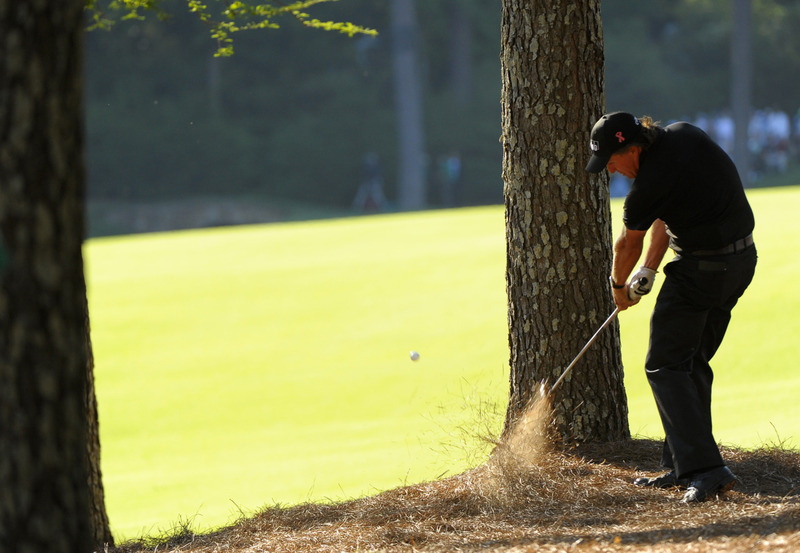 The most famous shot from the tournament (pictured above) was Mickelson’s second from the pine straw at the par 5 13th hole through two trees to inside of 5 feet. People forget, in peak Mickelson fashion, he would go on to miss that short eagle putt but would make the birdie coming back. Although that will be the shot that is remembered from the week, I think the birdie at the previous hole is what really spurred Mickelson to victory. 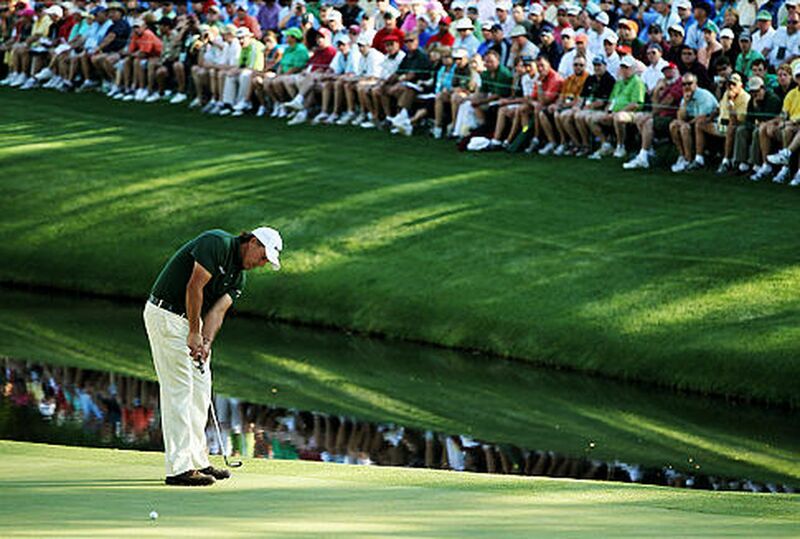 He would go on to birdie the final hole to finish three strokes ahead of Westwood to claim his third green jacket. In what was a somewhat painful round to watch, I firmly believe the 2016 Final Round was one of the most captivating rounds in Masters history simply because of its encapsulation of everything that can happen around the second nine of Augusta on a Sunday. Jordan Spieth again led after 54 holes (marking 7 consecutive rounds where he at least held a share of the lead at The Masters, wow) by one stroke over newcomer Smylie Kaufman. After birdies at 6,7,8 and 9 to finish the front 9 it seemed inevitable that Spieth would go back-to-back and win a second green jacket in consecutive years. After his birdie at the 9th hole, Spieth held what was thought to be an inextinguishable five stroke lead. A careless bogey at the 10th hole brought the lead down to 4, but still a sizable margin. Another poor bogey at the 11th brought the lead down to 3 and it again looked like we might have a golf tournament. Danny Willett picked up birdies at the 13th and 14th holes to reach 4-under and seemed capable of winning the tournament. Spieth then had his infamous collapse at 12 where he dunked consecutive shots into the water at the Par 3, eventually leading to quadruple bogey 7 and as Nick Faldo stated, “…unbelievable, the ironman…is having a complete meltdown” and it was painful to watch but also equally incomprehensible. One had to pinch themselves because it did not seem possible. Willett would make par at 15, but his partner Lee Westwood would chip in for eagle to reach -3, now only one behind Danny Willett and now shockingly two shots clear of Jordan Spieth! In a span of less than an hour, Spieth went from leading by 5 strokes, to trailing by 4 strokes, that is something I had never seen in my lifetime on a Sunday at a major championship. Spieth, showing great resilience, would actually pick up a birdie at the next hole and another at 15 to give himself a chance but eventually it was too large of a deficit to overcome as he would finish 3 short of champion, Danny Willett. Amateur Bryson DeChambeau was the low amateur at +5, so that was also cool to see as he has now turned into a top-10 player in the world. This Sunday will remain in infamy, but it truly shows the difficulties of winning around Augusta National. Another remarkable final round Sunday at Augusta, where eight players held a share of the lead, including Tiger Woods and Rory McIlroy. At one point during the back nine, five players simultaneously held a share of the lead. Rory McIlroy lead by four strokes to start the day over 2009 champion Angel Cabrera, K.J. Choi, Jason Day and Charl Schwartzel and got off to a rocky start, bogeying his very first hole. Rory did keep it together somewhat over the first nine holes, before coming completely unravelled at the 10th hole where two of his first three shots on the hole missed impossibly far left, leading to a triple bogey 7. Rory would implode to a final round 80 and finish a stunning 10 strokes off of the eventual winner. One of the biggest charges of the day was by Tiger Woods, who started with birdies at the second and third holes to get within five of Rory’s lead. A birdie at the 7th, followed by two mammoth shots to reach the Par 5 8th in two left Tiger around 10 feet for eagle to get to ten under par and within 1 of McIlroy. Tiger would go on to make the eagle putt and unleashed a patented fist pump which sent a roar loud enough that it may never be matched through the air of Augusta National again. Tiger would plateau through the middle of the round before unleashing a beautiful second shot into the green at the Par 5 15th which included a majestic club twirl and left Woods with a short putt for eagle. He would go on to miss this putt and finish tied for fourth. Australian’s Adam Scott, Jason Day and Geoff Ogilvy would all get a piece of the lead during the final round but it was South Africa’s Charl Schwartzel that would rise above everyone to capture the green jacket. Schwartzel would close with birdies at 15, 16, 17 and 18 to reach 14 under par and finished two strokes clear of Adam Scott and Jason Day. It was a remarkable display for Schwartzel who followed fellow countrymen Louis Oosthuizen, who won the Open the previous summer, to capture 2 of the last 3 majors for South Africa. On Easter Sunday 2012, Sweden’s Peter Hanson held a one shot lead over Phil Mickelson heading to the final round. Louis Oosthuizen charged into the lead on the second hole recording a double eagle, only the fourth in the history of the Masters and the first ever on the second hole. Bubba Watson made bogey at the Par 3 12th to drop two shots off of the lead but rallied to birdie holes 13-16 to reach the ten under number and tie Louis Oosthuizen for the lead. The two would both par the final two holes to tie at -10 and force a sudden death playoff. Watson and Oosthuizen would again play the 18th hole for the playoff hole and would play it similarly, both tapping in for par. With this tie, the playoff moved to the Par 4 10th hole to try and settle the tie. Both of the players hit subpar drives to the right of the fairway with Oosthuizen eventually coming up short of the green with his second shot. 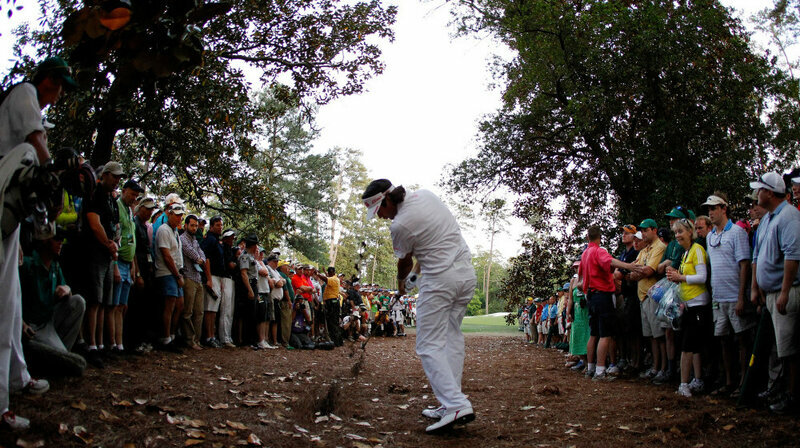 Watson, a left-hander, was left in the pine straw (pictured above) with no direct angle to the flag but was able to hook his wedge shot nearly 90 degrees to within 15 feet of the hole and what will go down as one of the most iconic shots ever struck at Augusta National. Oosthuizen was unable to get his ball up and down for par which allowed Watson to two putt and tap in to become Masters champion, his first of two. Fellow players, Rickie Fowler, Ben Crane and Aaron Baddeley were there behind the 10th green to greet a Watson who was overcome with emotion. It was a difficult decision to make, but the most memorable Masters moment for me in recent history was the final round of the 2013 tournament. 2009 Champion Angel Cabrera and American Brandt Snedeker held the 54-hole lead at -7, one shot clear of Australian Adam Scott. Fellow Australian Jason Day, held the lead after three consecutive birdies at 13, 14 and 15 to get to -9 but bogeys at the 16th and 17th cost Day and dropped him to -7 and solo third. In the penultimate grouping in front of Angel Cabrera, Adam Scott hit his second shot into the 18th hole to around 25 feet and left him with a decent chance for birdie at Augusta’s traditional Sunday hole location. Scott (pictured above) would hole the putt for birdie through the pelting rain and unleashed a massive double fist pump uttering the words “Come on Aussie!” as he looked at Caddie Stevie Williams in celebration. This would put Scott one clear of Angel Cabrera and at the moment, that seemed like the putt that would give Australia its first Masters champion and Scott’s first major title. Veteran Angel Cabrera had other ideas. Minutes after Scott holed his putt and the green settled, Cabrera hit, what I believe to be one of the most underrated clutch shots in golf history, through blistering rain in to about 4 feet and birdied the final hole to force a playoff with Scott. The sudden-death playoff commenced on the 18th hole where both players scrambled for pars and moved the playoff to a second hole, once again the 10th hole. Angel Cabrera eventually missed a birdie chance on the tenth hole and tapped in for par, setting the stage for Adam Scott to have a 15-foot putt to win the Masters. Scott would go on to sink the putt and Jim Nantz shouted “there it is…Adam Scott…a life-changer” as it was an emotional moment on the 10th green where Scott became the first Australian to win at Augusta. It was a wonderful moment of sportsmanship with Cabrera and Scott hugging it out on the green after the moments transpired as two-time major champion Angel Cabrera congratulated Scott on his first. Stevie Williams had been on the bag for many magical moments with Tiger Woods but I would have to guess he never felt the same positive emotion as he did with Adam Scott on that Sunday. Adam Scott after the round paid tribute to Australian Greg Norman saying, “It was only one guy who inspired an entire nation to play golf and that is Greg Norman.” Come on, Aussie. A Tradition Unlike Any Other, Springtime is upon us.